On Friday night there is to be a birthday dinner for the birthday siblings. In New Zealand. In the summer. Too far for Mama to catch a cab from the U.S. prairies. Sadly. Senior Son has been working on creating a Mama Meal from The Kitchen’s Garden Pages. Then it was discovered, with eyes rolling in horror, that I have not posted the Apple Crumble and an emergency call was put through. So very quickly yesterday afternoon, I gathered the last of the apples, made the crumble, and wrote down the recipe. This is harder to do than you think, when you have made the crumble your entire life by just heaving it all together and stirring. Now if you are invited to the dinner on Friday – close your eyes. Grate the very cold butter into the dry ingredients, (grate and stir, grate and stir, etc) zest the lemon in and mix with your fingers until it is crumbly. It needs to look like chunky breadcrumbs. 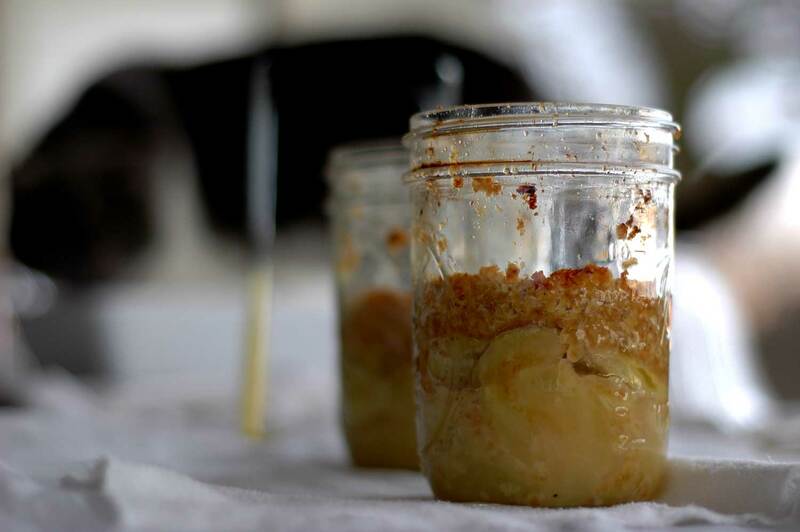 Grease your widemouthed jars (this will work in a baking dish just as well). 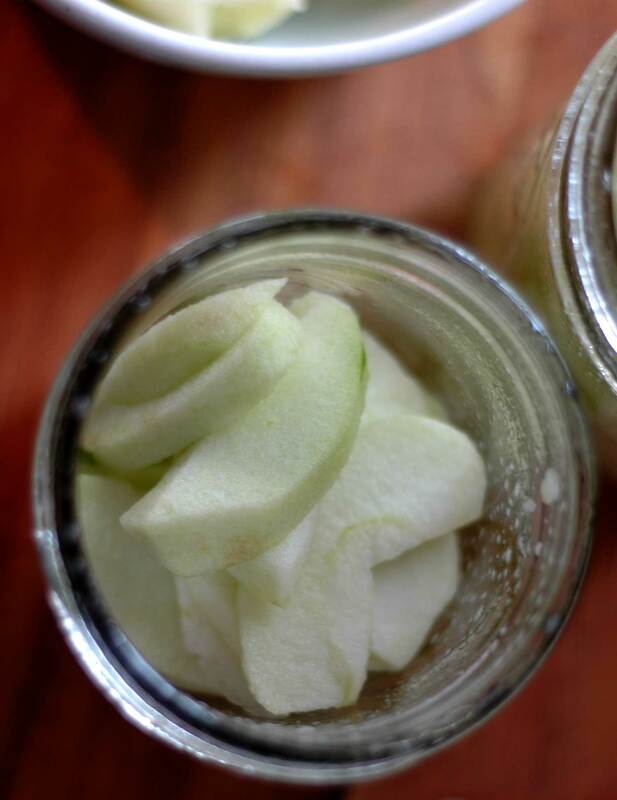 Pack with sliced Granny Smith Apples (or any other tart apples) until the jars are about two thirds full. Do not add sugar to your apples, leave the tart taste alone. Top with about 1/2 inch of the crumble. Sit your jars on a baking sheet in the oven for 45 minutes at 350F.. (about 160C I think.) Be careful when you take them out of the oven. They are hot and awkward. Don’t serve too hot. I made these as individual servings in wide-mouthed Bell canning jars (Agee bottling jars in NZ) . The pictures are of UnDressed Only-Just-Cooked Apple Crumble as I did not want to lose the light for a photo. These can be made ahead of time, (to the above stage) then warmed on low. Just before serving, create layers of colour in the jar. Maybe you could add a thin layer of whole blueberries or raspberries, then a small ball of icecream and a wee curl of lemon. Your sister will help with this. Jab a shiny spoon into the dessert and serve quickly so that the crumble stays crispy. I hope you can find the pint sized wide mouthed jars! If not you can make these in individual ramekins. If you have a few desserts left over, screw the lids onto the jars, pop in the fridge and take them for a pernick-nick (home talk for picnic) down at the beach on the weekend. Apple crumble is just as good cold! Can you see Mary’s Cat lurking in the back of this shot? He is thrilled that I am taking photographs of food outside again! Today we are forecast to reach 50F. All the baby plants have been watered gently with the hand rose in the shower, and are waiting to go outside as soon as it hits 40F. Hopefully we do not get too much wind. The big doors have been opened in the chook house, as well as the barn, so everyone is feeling springy and the chooks are laying like mad with all that extra light! Maybe I should make a pavlova and have a birthday celebration too! Dawn has come. Good morning! ← Sausage Rolls made with Buckwheat pastry. I read the instructions carefully but I’m sorry, but I can’t make this recipe. I don’t have a sister to help with the step of adding color to the jar. Will the recipe work if I do all the steps myself? PS I hope you know that this is not a serious question, just a bit of Ronnie-style sarcasm/irony/silly humor. Oh yum, haven’t had apple crumble in ages. Hmm, not for a crumble. Peach crumble bars, apple cake, some cobblers…Must remedy. Yes, I think you should make a Pavlova! The best one I’ve ever tasted was in Hong Kong, believe it or not, at a little restaurant called Lucy’s. It had pink peppercorns in it. Such a wonderful surprise to see those little pink jewels in there. And speaking of apples, I just sorted through mine that are stored in the shed, and they’re holding up brilliantly. A few are a bit soft, so I’ll make applesauce from those today. Thank you Smidge, I have always described myself as a farm cook! In a jar. I would never have thought to do that. Nice presentation idea. One of my all time favouritie desserts and I love cold crumble too! Such a shame you won´t be with them in body, but I am sure you will be “in spirit”! In a jar! Ha ha! I wasn’t sure where you were going with this recipe. At first I thought you were going to seal them all up in your pressure cooker and ship these off to New Zealand for the birthday party, the whole time thinking, “it’ll never get there by Friday!” I love the concept, especially the portability option! Brilliant, as usual Cecilia! What a pity there isn’t a cab to take you across the water for the celebrations. I’m with Smidge – one should always make extras to eat for breakfast! Lovely and simple…always a favorite combination! As soon as I began reading this I became excited to do this for a picnic….and then you mentioned it! Well in your own way, of course….pernick nick 🙂 Isn’t it so great to be able to share our family recipes with our children – photos, directions and all in this way!! I love that they called you for the recipe! Doesn’t matter how old kids are, Mom is still Mom!!!! What a great recipe! Cant wait to try it! Let’s see if this will work this time. Having DSL probs. Yuck! I believe that in Minnesota we call this “Apple Crisp.” But I’d never considered baking it in jars. Love the idea. I’ll try it next fall when apples are plentiful. Yummy. I put ginger in my crumbles, as well as oatmeal. Last time something went wrong and we were breaking teeth on it! Mine are made in a big dish – 3 at a time, with two frozen. My energy level runs out often, so it’s good not to have to cook always. I do this with most dishes, sweet and savoury, or I make a huge batch of sauce eg pepper sauce, and freeze it in small containers. I agree with making bigger batches and freezing, i do that all the time, mainly because i find it almost impossible to cook for TWO! after years and years of cooking for a big family.. Morning viv! I adore dessert in jars! And it’s so fitting for a homey, delicious dessert like crumble. These look beautiful, C.
Ditto on how great the jars are! Yummy feast for eyes and tummy! These are wonderful! They look delicious and what a fun way to serve dessert. A great idea for a summer barbecue too. Love this! Love that you used canning jars for the crumble. I’ve got stewed apples in the freezer, and I was wondering what to do with them. Rick is going to LOVE you tonight. Happy birthdays to your family. Mmmmmm! We made a pineapple-apple crisp last night and this has reminded me it’s waiting in the fridge. THANKS! I love the idea of seeing layers of colour through the glass. Happy Birthday to the siblings. We call this “apple crisp” where I am from, skip the bran and the lemon, and add nutmeg and cinnamon, but this time of year it would have to be pear crisp or crisp from frozen peaches or berries. I often make crisp with mixes or whatever is in season: peaches and blackberries, nectarines and plums, varying the spices used with the fruit. Sometimes I use some whole wheat pastry flour in the topping. Apple crumble is a forever favorite of mine. Yours look so pretty in their jars! Celi, this is dreamy. So dreamy. It’s making my mouth water. I love that your kids are making Mama’s dishes at home in NZ. That’s sweet and I hope my kids will do that same sometime when they are grown. I am so happy you shared this family fave as well. What a great idea and so delicious looking! Sounds good Celi … many thanks. BTW, I believe you are a wine drinker, so you may enjoy this unique look. http://afrankangle.wordpress.com/2012/02/21/on-by-numbers/ … and good afternoon! Mmmmm. I have to share this one, C. My daughter just did a project about “5 things made from apples” and she and I were both appalled that she had never tried apple crumble. She could make this herself (she’ll ADORE the little mason jars) and then put on her wee oven mitts to serve it to everybody. So awesome! I love apple crumble but could have never thought making it in a jar… Really gorgeous!!! I have to try this soon. I love it that the photos are taken outside, I’m glad I’m not the only one doing this! Aw! It’s like you will be there in the form of this sweet dessert. I love the idea of making it in jars and then piling on berries and maybe some drippy sweet ice cream! So practical yet so charming. And how many of us can come with you to NZ? I am just going to say “I love it all” — your recipe, the way you wrote, the pictures (glad I am not the only one trying not to miss the real light outside). Lovely. What a lovely tradition. Can I have a wee drop of Calvados on the apples, just before the crumble. I just had a dessert in a jar while traveling. I have a lot of mason jars so I must try your apple crumble. What a gorgeous idea to bake them in the jars, nice novel serving idea for a dinner party. I just remember the first time I have had apple crumble was in Germany, It was made by a english girl I used to live with, fabulous…..
That is a great recipe, C! It looks delicious and seems simple too, so is kind of perfect. Looks yummy. Too bad you can’t celebrate together. Picnic crumble! – that is a sweet thought.